Blackrock Mountain is Now Live! Adventurers! There are some … minor annoyances I may ask you to attend to within my precious Blackrock Mountain. Take heed – a certain elemental lord is acting hot-headed. HEROES! BOLDLY, YOU SOUGHT THE POWER OF RAGNAROS – THE TRUE LORD OF BLACKROCK MOUNTAIN! You’ve been a smoldering thorn in my side for long enough, you overstuffed candle! Your time has come! The first wing of Blackrock Mountain™: A Hearthstone™ Adventure has opened! We know you’d “lava” to test your decks against the powerful elementals and nefarious dragons that lurk within this massive mountain - and now’s your chance! For more information on what lies within the heart of Blackrock Depths, click here. Access to wings may be purchased using in-game gold or real world currency. Wings can be purchased individually for 700 gold or $6.99 USD. Players can earn the in-game gold needed to unlock the next wing by completing various quests or emerging victorious from the Arena—or they can choose to unlock the next available Blackrock Mountain wing using real money. 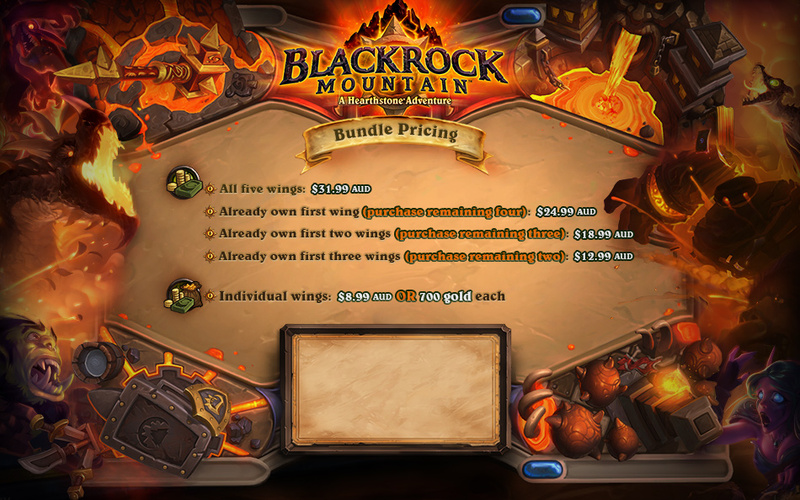 Blackrock Mountain bundle packages are also available! With bundle packages, you can unlock any remaining wings you may have at a discounted real-money price. 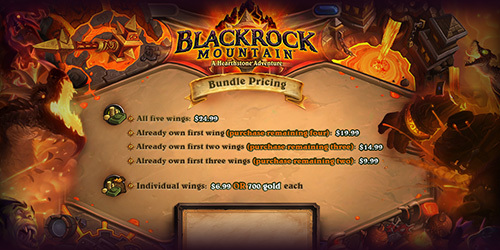 While purchasing Blackrock Mountain wings in bundles doesn't give you early access, it does prepare you to dive into the next challenges as soon as they unlock! Check out the bundle prices in the image below. Learn more about Blackrock Mountain: A Hearthstone Adventure here!